Children are often told, “You can be anything you want to be when you grow up.” If that were truly the case, there would be a lot more ballerinas and astronauts. But it’s never too soon or too late to start dreaming about your career. 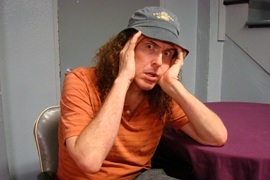 Weird Al Yankovic is famous for changing the words of hit songs to make them funnier. For instance, Michael Jackson’s “Beat It” becomes “Eat It” and the song is about food. Al also writes original music, has appeared on TV and in films and most recently is the author of a book for children called When I Grow Up. We recently sat down with Al to talk about what it means to “grow up” and his unusual career. Jason: Alright! Welcome to English, baby! How are you today? Al: I’m well, Jason, thank you so much for asking. I appreciate your concern for my well-being. Jason: Oh good! You’ve got a children’s book coming out real soon. Can you tell us about that? Al: It’s a book for kids, it’s a picture book. It’s basically a story about a kid who goes to show and tell and he sort of has an overactive imagination, and he just kinda riffs on all the cool and amazing things he wants to be when he grows up. Jason: “Grow up” is, like, a pretty common idiom, and it can also be kind of an insult. You know, you can say to somebody “Grow up!” Can you tell us what that means, to, like, tell someone to grow up? Al: Well, that particular phrase probably means that you’re being immature. That you need to be a little more adult-like in your social conventions. In my case though, it was more about talking about what professions this kid wants to be when he’s older. When he’s an adult and he has to make his own living. So, it talks about the various vocations he’s considering. Jason: So, did you want to be a comedian and a musician when you grew up, or did you have other ambitions at a young age? Al: Truthfully, when I was a kid I was a little more realistic. I never really thought that I’d be able to make a living doing the kind of thing I’m doing now. I always thought, well, I’ll probably have to have a real job. In fact, when I was twelve years old, I decided I was going to be an architect. Because I had some aptitudes in math, and I was pretty artistic and I loved my drafting class. And I thought, well, you know, I can design things and, you know, get my art out that way. And I found out in college that I was OK, but I… wasn’t passionate about it and I wasn’t…more talented than the other kids in school. I was average at best. And I thought, well, gosh, do I wanna be going through my life being mediocre? I’d rather, you know, be excited about something and, you know, be at the head of my field. So it was kind of a strange time for me because I graduated college with a degree I was pretty sure I was never going to use. Thankfully I got a few lucky breaks and now I get to be Weird Al for a living! Jason: Alright! When you’re being Weird Al for a living, is there anyone in your life who has said, like, “Weird Al, you need to grow up!” You know? Al: Probably…certainly not in the last few decades. No, I mean, my parents were always very supportive. They basically always said whatever I wanted to do. They realized that I wasn’t just a goof-off. I was a valedictorian in my high school, I was a straight A student. If I wanted to take a stab at show business it wasn’t some kind of flighty impulse that I hadn’t put any thought into, it was something that I really wanted to make an honest effort at. Jason: Well, thanks so much, Weird Al! Can I get you to give me a high five and say “English, baby!”? In Weird Al’s new book, When I Grow Up, a young boy imagines all of the different things he could do when he is an adult and has a job. When Al was younger, he thought about becoming an architect because he was good at math. But soon he realized he was better at entertaining than at designing buildings so devoted himself to being Weird Al. If you think someone is acting childishly or immature, you can say, “Why don’t you grow up.” It’s a mean thing to say, but sometimes people need to be reminded to act like adults. Although Weird Al is very silly on stage, no one has told him to “grow up” for a long time because he is good at what he does. Purchase When I Grow Up here. I have been wanting a traveler since I was a child. Now I still want to see the whole Earth so for this I need to be a professional guide. Oh I wanted to be a lot of things when I was young. I wanted to be a doctor (which all kids wanted to be), an astronomer, a pharmacist, a voice actress (and I still I want to be that XD), etc. Unfortunately, all my dreams were crushed and now I’m studying something which has nothing to do with what I wanted to be :/ oh well, this is life. Al Yankovic is an interesting character. He Plays music, entertains people, and has created a new music genre; parody. The name “weird” seems appropriate for him, although he was not so weird as i guess, he just know the best from himself. High Five for Weird Al Yankovic !!! When I was younger I wanted to be a scientist. I liked to read abot Universe and animals. I thought I would work with animals, explore our Solar system or jist fight against poachers. But I don’t really think that I’ll do sth like that in the nearly future. Lovely lesson. I saw Weird Al Yankovic on You Tube and he impressed me. I become a fun of them.Thank Jason, fantastic! LOL! I want to say:"If I were young …" But I'm a middle-aged man now. When I was young, I have no time no chance to think, I must go to college , I must finish my school life and make a living as soon as possible. I keep running running and running. love Weird Al, he’s genius! The guy is a genius! When I was a child I dreamt to be an artist. My dream didn't comes true. Unfortunately, I've never heard from Weird Al before. Thanks a lot English, baby! for this wonderful entertainer.I look daily at his You Tube movies to edge off after a stressful work day. I like very much his voice and especially the pitch and his sound. It's an awesome man and a great head of the field! i chose accounting but i still like animals especially predators. I was an imaginative child. I wanted to be an astronaut, when I grew up. In spite of my evident aptitude in humanitarian subjects in school, I went to a technical university, because it was difficult to make a living being humanitarian specialist in Russia. At the present time I like to take a stub to riff various things. I hope I will choose one of them and find an appropriate vocation where I will be able to make an excellent career at the head of my field. When I was young I wanted to be a musician in a heavy metal band. Because I`ve always liked that kind of music. In fact, I was in one ten years later. Althought it just became a fancy. Finally I devoted to study a college career. if you got lucky like Weird Al ,VERY COOL MAN …....SO not everyone really know what he will expect in this life from the job he will get or the way that WILL lead him to it ….. most of us i think when they were in their childhood had their goals of what they will be and most of them didn't . me for an example ! WHEN I was a young child , I wanted to be a singer …. when I was a child , my mom told me to be a scientist.Maybe in her opinion, scientist is the most learned vacation in the world, and her told me you have to go Harvard University to be a scientist.